· Sociology is the study of human social life. · every society whether ancient or feudal or modern, Asian or European or African human groups and collectivities exist. · Types of groups and collectivities are different in different societies. · Any gathering of people does not necessarily constitute a social group. · Aggregates are simply collections of people who are in the same place at the same time, but share no definite connection with one another. · Such aggregates are often termed as quasi groups. · whose members may be unaware, or less aware, of the existence of groupings. · The members of primary groups have a sense of belonging. · Maintain formal and impersonal relationships. 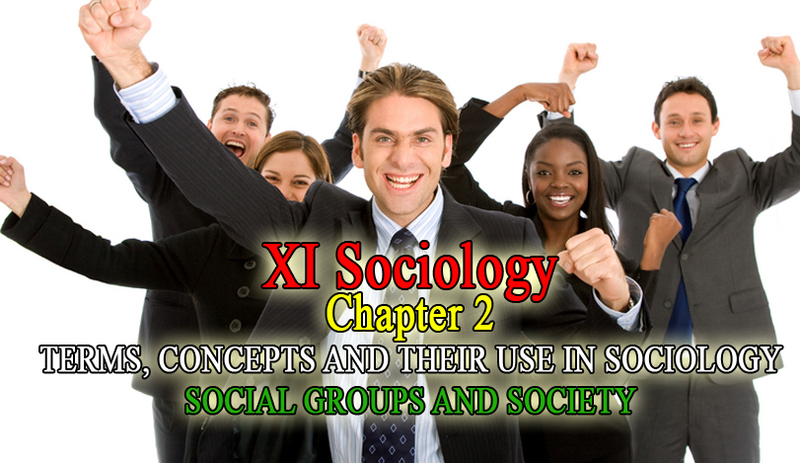 · The primary groups are person-oriented, whereas the secondary groups are goal oriented. o Example:- Schools, government offices, hospitals, students association etc. · Community is the living population within a limited geographical area carrying on a common interest. § Example: family, with real friends or a close-knit group. o transitory relationships of modern urban life. · You may draw a parallel between the community with the primary group and the association with the secondary group. · The groups whose life styles are imitated are known as reference groups. o a person copies the life style of any film actor or artist. o In colonial period, many middle class Indians tried to imitate English man. · Reference groups are important sources of information about culture, life style, aspiration and goal attainments. · It is a group of people of the same age, status, interests, etc. o Example: classmates, school mates etc. · Often peer group influence on children is grater than parental influence. · Social stratification refers to structural inequalities between different groupings of people. o less privileged near the bottom. · Every individual and every household in society are affected by stratification. · Four basic systems of stratification in the society. · Slavery is an extreme form of inequality in which some individuals are literally owned by others. o Southern States of the USA in the 18th and 19th centuries. · individual’s position totally depends on the status attributes ascribed by birth rather than achieved. · Each position in the caste structure was defined in terms of its purity or pollution relative to others. · the Brahmin priestly castes, are superior to all others and the Panchamas, sometimes called the ‘outcastes’ are inferior to all other castes. · Class is a typical social stratification found in Industrialized society. · In a class, a person’s social status is based on his/her achievements. · Class is an open institution. · An individual can change his/her class and acquire high status in social stratification. · Kind of class: Higher class, Middle class, lower class, Agricultural class. Ø Rigid rules in marriage, eating- habits etc. · Class system allow social mobility. § One may go to higher to better class or go down to a lower class. · According to Karl Marx, capitalist society consists of two classes. · The owners of means of production: factories, business, equipment. · According to Marx, Bourgeois in capitalist societies exploit workers. Life chance – Max Weber. · Life chance is the social science theory of opportunities, each individual has to improve his quality of life. · Inequality, Weber argued might be based on economic relations. But it could also be based on prestige or on the political power. · A position in a society or in a group. · It refers social position with defined rights and duties assigned to these positions. · Dynamic, Behavioral aspects of status. · Status is occupied, while role is played. · Achieved by the person on the basis of personal merits or qualifications is called…. · Status and prestige are inter connected. · Every status is accorded certain rights and values. Values are attached to social position. · The value attached to the status is called prestige. · People can rank status in terms of their high and low prestige. o It is a process of fixing a particular role for a particular person- man and women. · Role and status are not fixed. People fight against discrimination based on cast and gender. o It means official, codified and systematic means of social control. it includes control by state, law, police, bureaucracy, army, political power, educate etc. o Personal, unofficial and un codified.